The greatest football tournament, sorry the greatest sporting event alongside the Olympic Games, has begun in South Africa over the previous weekend, though you probably knew this and I thought I would share my thoughts on some of my observations. Don’t worry, this will not contain a ‘easy-to-do’ have a go at Robert Green or an acknowledgement that it has been way too long for the tournament to finally be held in Africa. No, this is more of a quirky look at irritations or previously annoying points within the game that ARE actually doing well, so far, though it is only day four and it probably won’t last, so I should heap the praise on whilst I can. I must say I like the atmosphere and sound created within the stadiums in South Africa and I am proud to admit I am a fan of African football and with this I am a fan of the Vuvuzela. Yes the sound is deafening but this is ten times better than a quiet stadium in Germany or at the European Championships in England back in 1996. It has become popular and even trendy to have a dig at the sounds created by them, but this is how the Afrikaans like to enjoy their sports and we should be gracing their cultures with opening arms. Keep blowing your horns and ignore those idiots who wish to see them banned. In the opening game between the hosts, South Africa and Mexico, it seems almost all the players were wearing a branded predominately grey with orange heeled football boot, which appear to have been designed by two or even three of the major brands. Since then, I have spent a proportion of my time when watching the matches looking for players bucking the trend against these boots and even awarding hero status to players sporting black, yes black boots, how bizarre are they? I have stated my opinion on colourful boots in the past, I don’t mind many of them but its a huge no-no from me when it appears everyone is wearing them. Go on be different, be normal!! This is just about the actual presentation and studio guests from both BBC and ITV. I believe both have got the opening credits right, as they have done so with their main and highlight presenters and the array of studio guests, Clarence Seedorf being a particular favourite of mine. I appreciate they have used African themed music and work to present the titles with an element of style. Though more can be said about commentating teams, but please read on for this. 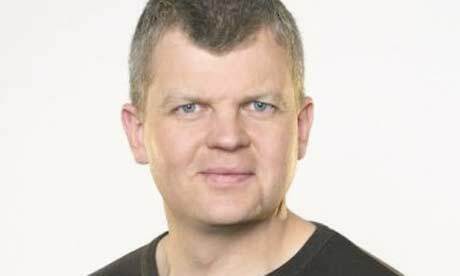 Adrian Chiles (pictured above) has proven to be a success in his move to the dark side, I dread to think how ITV would have coped without him. Enough is enough. How many times can you show a berated Fabio Capello clapping his hands together in one half of football? Its appears the answer is an annoying several to say the least. I’m all for the use of slow-motion cameras when they add to a sport i.e. a boxer getting his full in the face or a high-impact challenge in Rugby Union, but it has to have its limits. It was at its most annoying during the England versus U.S.A. fixture, during which we missed passages of play whilst seeing a slow-motion replay of anything and everything. The commentary teams of the two main channels in England, need to take a long, hard look at themselves and realise that many mistakes are made by their commentators and so-called expert co-commentators. I appreciate it is a high pressured and difficult job but not to surely correctly pronounce a player or country’s name. They seem to spend time working on background statistics and the like but start with the basics and work forward from that point. Peter Odemwingie was actually pronounced by Mick McCarthy as ‘their No. 11 as I can’t say his name’ – Shocking. Do the basics and then the fans will begin to respect you, this is a note to the commentary teams as well as Robert Green (sorry I had to). One of the most impressive aspects of the tournament so far has been the officials in arguably every match. 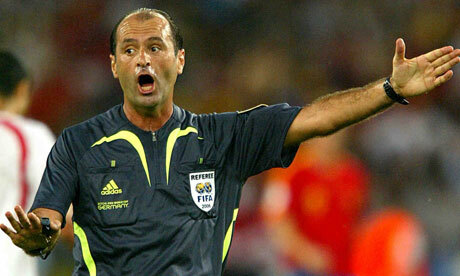 I would even include, Carlos Simon (pictured above), the Brazilian referee, who we all doubted before England’s opening fixture. All have been consistent, firm and proven to be the best of their profession. Words I honestly thought I would not hear myself say. The assistant referees have back the referee up to superb accuracy and in a world of modern technology it is a joy to see. Fingers are crossed this continues, will it? Probably not! The golden boy of Argentine football (pictured above) has had many doubters in his tenure as the manager of the national side for whom he produced many a magical moment in his time as a player and captain. I’ll admit to been among those doubters, but ‘El Diego’, brought these doubts on hisself, using over 100 players in his time in charge, not preparing properly for fixtures, many an argument with the press and not selecting certain players for the World Cup. Yet, on Saturday his team played well, he had an effective system in place, which worked and would appear to be able to work effectively against tougher opposition. As usual, many thanks for reading and if you have anything you have noticed with you wish to add to the list, then feel free to leave a comment or two. Enjoy the next few days of fixtures. Well done, although I do have to disagree with you on the vuvuzela’s. It was next to impossible to hear the commentary over the “buzz” from the “hive” (stadium). It really became annoying before the half in the England v USA game. I can only imagine what it must sound like live and in person! Looking forward to more of your commentary over the next few weeks. Cheers. Thanks for your comment it is much appreciate, why not sign up on her (if not already done so) for email updates when I publish blogs?? 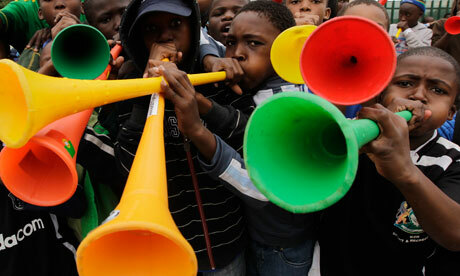 Some would say the sound of the vuvuzela is better than most commentary teams, haha…. Oh well, on with the tournament we go. This article is another reason why am one of the greatest gaffers fan. Well done. Concerning the vuvuzela, I agree with you, we (people living in Europe) tend to find anything different from our culture, not worthwhile promoting, this is a shame. Africa is organising this world Cup, so let them do the African way; we have already done the European, American and Asia way. The vuvuzela is one of the many supporting tools we can embrace in our stadium and it is also a good business opportunity. Also the French TV Canal+ has found a way to block the noise, which is a more sensible way to deal with it rather than complaints. The vuvuzela is a great addition and I am pleased you agree with my views, it has got better as the tournament has progressed as they appear to have developed patterns and songs with it. I don;t think we need to block the stadium atmosphere a la canal+ but maybe blocking the terrible commentators would be a god idea. Let England do it today!! !